New! Cydral FastFace is now able to analyse Facebook, Vkontakte (VK), Twitter and Instagram pages and extract contents from public profiles. Cydral expects to provide a general release in mid-September in order to support and provide results from these main active social-media sites. FastFace is a comprehensive facial recognition system capable of finding identical or similar persons. Based on advanced AI algorithms, Cydral Technology’s experts in machine learning created a smart and innovative search engine to enhance the user experience for people identifying. Given a detected face extracted from a picture taken by a camera or loaded from a library and a set of public candidate faces to search with, the FastFace search engine finds a small set of faces that look most similar to the target face. Additionally, and for each uploaded image, FastFace returns attributes such as the estimated age and the gender. Unlike other face recognition technology, our FastFace system allows quick searches in big data sets. Our technology can work with any photographic database, current results though it use public images on the Internet indexed by our specific crawlers. 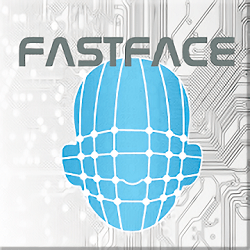 FastFace allows you to provide photos of similar people and related public information, mainly where the image appears on the Internet. It is not a reverse image search engine, but a comprehensive system integrating a top quality face recognition technology based on several deep learning algorithms developed by Cydral. Collecting millions of faces from Web images, our service finds out a person within few seconds, retrieving results from our database of about 350 millions analyzed web pages. ✓ Large-scale search by photo: you see a celebrity on the street that you can’t quite recognize… FastFace him/her! Cydral FastFace is thus probably the world’s largest facial system available to the general public at the present time. With the support of all our users, we will continue to produce high value-added products and services. We look forward to archieving the objective of 500M analysed web pages very soon! • Minor bug fixes and so much more!